. : Optics & Photonics Focus :: Close up on DNA :. We know quite a bit about our genetic code, the DNA. We know its composition, its structure, and also its function. However, we have not yet been able to look at the famous double-helix directly. Using some powerful microscopy techniques it is now possible to actually look at the primary windings of a DNA bundle. DNA in a droplet on a super-hydrophobic surface. Artistic view of the evaporation process: the water cannot adhere to the super-hydrophobic surface, while the DNA bundles remain suspended and well tense. Picture Credits: E. di Fabrizio et al. DNA. The molecule of life. We know a lot about it. It plays a central role in the reproduction and evolution of living organisms. It is a very long molecule arranged in a double-helix, the structure of which we have not yet managed to look at directly. An Italian group of scientists from IIT (Italian Institute of Technology) in Genova, IMEM-CNR in Parma, and University of Magna Graecia in Catanzaro, led by Enzo di Fabrizio, has now obtained a direct picture of a DNA bundle showing, with very high definition, its periodical windings. The classical approach to determining the spatial arrangement of DNA is based on X-ray diffraction patterns of DNA crystals. Diffraction methods are difficult to understand for non-practitioners because they are indirect and require a lot of data analysis in order to produce an image of the object. Imagine you are on a bridge and want to know whether any rocks are emerging from the water underneath. You can infer this from the pattern formed by the wavelets on the water surface — in fact, you can even reconstruct the shape of the rocks from this diffraction pattern. Or, you could simply look at the rocks themselves. Example of a diffraction pattern. 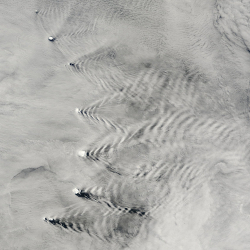 A view from space of the Sandwich Islands, in the Pacific Ocean. One can clearly see the diffraction pattern formed by the waves after these meet the emerging islands. Picture Credits: Nasa, Earth Observatory. In the case of DNA, the analysis of diffraction patterns is a very effective, solid and reliable technique for revealing its structure — and the structure of most molecules, for that matter. The recipe goes as follows. First, a DNA crystal is grown from genetic material. The crystal is then irradiated with X-rays, this way collecting scattered radiation which, in its turn, forms a diffraction pattern due to the superposition of all the scattered radiation. Finally, the molecular structure compatible with the measured diffraction pattern has to be reconstructed. With this method, J. Watson and F. Crick discovered the double-helix in 1956  – a discovery that earned them the Nobel Prize in Physiology or Medicine in1962. Be that as it may, looking directly at DNA would be a more accurate way of learning more about its properties. After all, seeing is believing. A DNA image cannot be taken with a standard digital camera, because the features of a DNA molecule are extremely small: they are on the atomic scale. This is much smaller than the wavelength of visible light, which is what ultimately determines the resolution limit of a camera. The wavelength of visible light is several hundred nanometers long — the length of several thousand atoms in a row. Therefore, di Fabrizio and coworkers employed a technique known as Transmission Electron Microscopy (TEM), which employs high-energy electrons instead of photons. High-energy electrons can be used to achieve atomic scale resolution, since their wavelength is much smaller than that of visible light and, in fact, much smaller than the wavelength of typical atomic distances. TEM image of a DNA bundle. An image of a DNA bundle obtained using Transmission Electron Microscopy. The periodical pattern of the windings can be seen. Picture Credits: E. di Fabrizio et al. Di Fabrizio and coworkers set out to obtain an image of a DNA bundle. They needed an isolated, long, well stretched DNA bundle in order to be able to take its picture. They decided to suspend this between two nanopillars, just like as if on a clothesline stretched between two poles — yet another technique developed by this team of researchers . Basically, the idea was to prepare a water solution with some DNA in it and place it on top of two neighboring nanopillars, so that as soon as the water evaporated some DNA bundles would remain stretched between them. Since di Fabrizio and his group used TEM to image the DNA, they needed to collect the electrons transmitted after the interaction with it. Therefore, they drilled holes in the substrate between the two neighboring pillars. "We were able to suspend DNA between pillars on a super-hydrophobic surface," di Fabrizio comments. "At that point, I got the idea that by removing the substrate background, the TEM image would be much improved. At this point I thought that ‘suspended’ had to be combined with ‘substrate free’." With this technique the team was able to obtain a picture of a very thin, well tense DNA bundle, constituted by 7 DNA filaments, one in the middle and six symmetrically disposed around it. 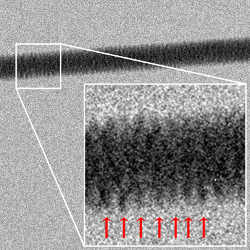 In the TEM image we can see the periodical windings of the external helix. 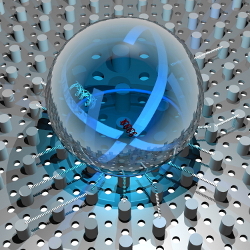 Now they are working on obtaining an image of a single filament and on possibly being able to resolve single DNA bases. The hope, di Fabrizio concludes, is to obtain more information about the mechanisms regulating the expression of genes by looking into the modifications in the external structure of DNA connected to the activation or deactivation of a pair of genes. J.D. Watson & F.H.C. Crick, A Structure for Deoxyribose Nucleic Acid, Nature 171, 737-738 (1953). F. De Angelis et al., Breaking the diffusion limit with super-hydrophobic delivery of molecules to plasmonic nanofocusing SERS structures, Nature Photon. 5, 682-687 (2011). AC is currently working as a postdoctoral researcher at Bilkent University, Ankara, Turkey. Francesco Gentile, Manola Moretti, Tania Limongi, Andrea Falqui, Giovanni Bertoni, Alice Scarpellini, Stefania Santoriello, Luca Maragliano, Remo Proietti Zaccaria & Enzo di Fabrizio, Direct Imaging of DNA Fibers: The Visage of Double Helix, Nanoletters (2012) 12, 6453–6458 (link).